Found: Good news! 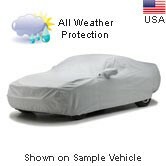 We DO have car covers for your vehicle. 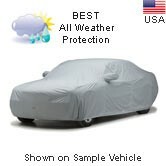 We do have a cover for your vehicle. However, we require you to call for a custom price for this cover. Please give us a call at 1-800-385-3603 Monday to Friday, 9am to 5PM PST (West coast time) and we will be able to take your order. We will give you a special deal for having to call in. 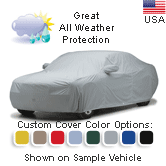 100% Custom Made To Order.WeatherShield® HD is the ultimate quality, all weather car cover designed for the toughest of outdoor elements including the harshest of sun, snow, rain, etc. 100% Custom Made To Order. WeatherShield® HP is a high quality, all weather cover providing excellent protection from the elements while still maintaining a light weight. Multiple color options! 100% Custom Made To Order. The 4 Layer Noah® Covers feature a high performance non-woven fabric for maximum dirt/dust and moisture resistance. 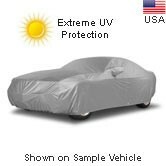 On the inside there is a soft fleece inner lining to cushion your vehicles paint. 100% Custom Made To Order.Reflec'tect® covers provide an affordable light weight cover offering a high level of protection from UV rays keeping your vehicle cool and extending the life of your exterior paint.